“When can we expect to see results?” is the infamous question that people in marketing and sales hate to be asked. It is a difficult question to answer, because there are a lot of factors that influence the success of any campaign or initiative. Some of these factors include: aggressiveness of the campaign, sophistication of your competitors, level of competition in the online market, budget, sales close rate, length of the sales cycle, and more. However, despite all these factors, one of the simplest ways to illustrate when results can be seen is outlining short term versus long term tactics. Results from short term tactics can be seen immediately, but can be expensive and unsustainable. Long term tactics on the other hand can yield better quality results, but require more time and investment to build and produce. The mix of these tactics is what determines your digital marketing strategy. In this post, I will break down examples of both types of tactics to generate leads online — along with their pros and cons. Running paid ads using Google Ads or a social network allows you to get in front of your prospects immediately — which subsequently generates leads. This can be a valuable tactic, because these prospects are often looking for a partner to help them in that moment. Although this may deliver an immediate influx of leads, it’s not always the holy grail of marketing tactics. Some downsides are that paid ads can be very expensive, they don’t always attract the right leads, and they may be ineffective if the target audience doesn’t search for business in that way. Directory listings are repositories of organizations that provide a specific service or product, all on one website. They often feature both free and paid listings, as well as reviews. 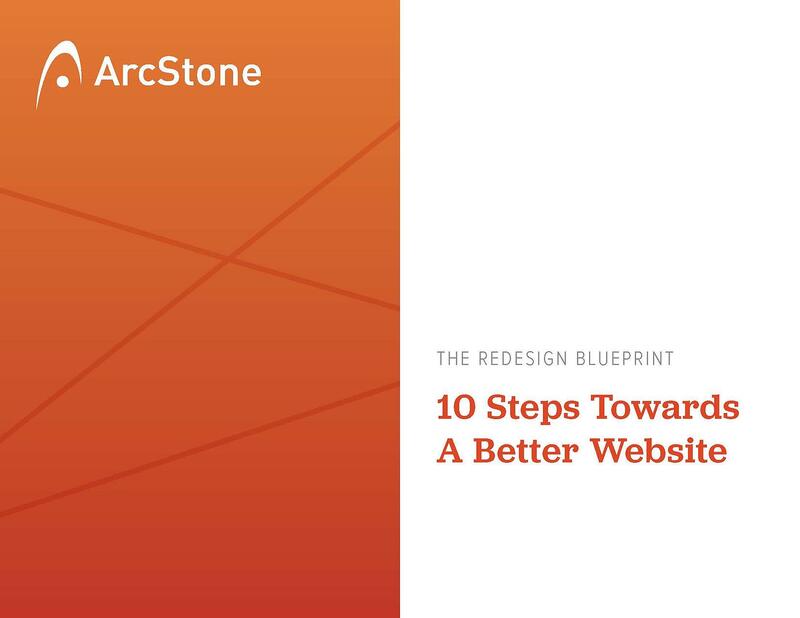 For example, one of the most common directory listings that ArcStone has leveraged for our software customers is Capterra. It provides a list of the top software products across all categories in one place. This can be more effective than the paid advertising tactic, because they are often paired with real user reviews and feature sets. The only real con is the paid listing fees — which can be quite expensive, especially in an active bidding structure. Half the battle of targeting the right type of people is obtaining contact information through purchasing lists, or having them convert/subscribe on your website. One way to to increase business, and bypass that step, is to leverage existing contacts and customer lists. Clean up and segment current contact lists, create a cadence strategy or workflow to engage with customers more than once over time, and then implement the plan. Some cons of this tactic include: consolidating scattered email lists across various excel spreadsheets is difficult, contacts may be outdated, or customers can turn away when the wrong message arrives at the wrong time. However, if you want to start some conversations today, this is often good place to start. For all of the above, results can often be seen within a few weeks once you determine a strategy and set things up. Content marketing is on nearly every businesses’ marketing wish list, but many often fail to execute it because it requires long term dedication and consistency. It can be extremely frustrating because results are not seen right away, and it’s hard to keep momentum if there are not enough staff members to write content internally. However, there are unseen benefits along the way for sticking with content marketing. Prospects and customers will begin to view you as a thought leader, your sales team will have great content on hand to share with prospects (also called sales enablement), and you’ll create a repeatable content production system that is much easier to execute. Another huge advantage to this long term strategy is that the results tend to compound over time versus a one off paid advertising campaign. **One big caveat for content marketing. Results are also largely dependent on the quality and aggressiveness of content production. You’ll likely see zero results publishing one post a month but can make real progress with a more aggressive strategy (6–12 per month). For example, check out our post on how we quadrupled our own blog traffic with an aggressive and consistent strategy. How we quadrupled our own agency’s blog traffic in two years. Building up a social media presence is typically a longer term tactic that requires dedication just like content marketing. Aside from consistent and thoughtful posts, you also have to choose the most effective channels. However, if you do build up thousands of followers, there is an active community that you can engage with immediately. The primary downsides of building up a social media are that social algorithms now limit how many people your post may reach, and many social channels aren't appropriate or effective in reaching the B2B buyer. The ideal outcome of content marketing is that you drive qualified prospects to your website and they convert (subscribe, contact, download information). Marketing automation allows you to extend that interaction by dropping converted contacts into workflows or drip campaigns. This is a long term tactic because many contacts may subscribe one month, but not reach out until they are sales ready ten months later. Automation allows you to stay in touch without sales effort or prodding emails and phone calls. 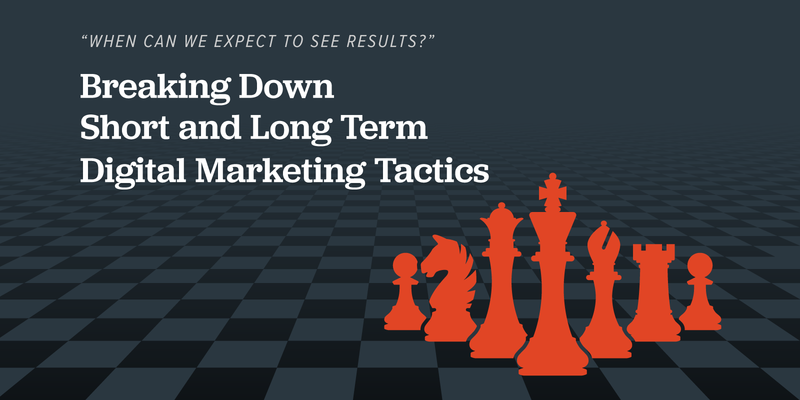 Overall the timeline for most long term tactics is three months at a minimum. Although not a perfect formula, thinking about short term versus long term tactics can help you temper your expectations. Most businesses require a digital marketing mix of both in order to be effective and build up a consistent funnel. Contact us today if you’d like our help in determining your optimal digital marketing mix to reach your goals. If you're lost on where to start, check out our 10-Step Checklist!